Nova Southeastern University is making history. Along with NSU’s leadership, President Hanbury announced the most transformational development in the university’s 53-year history. Looking for a way to truly make a difference in the world, a Tampa Bay couple already well known for philanthropy – cardiologist Dr. Kiran C. Patel and his wife, pediatrician Dr. Pallavi Patel – are making a $50 million gift, and an additional $150 million commitment in NSU’s future Tampa Bay Regional Campus. 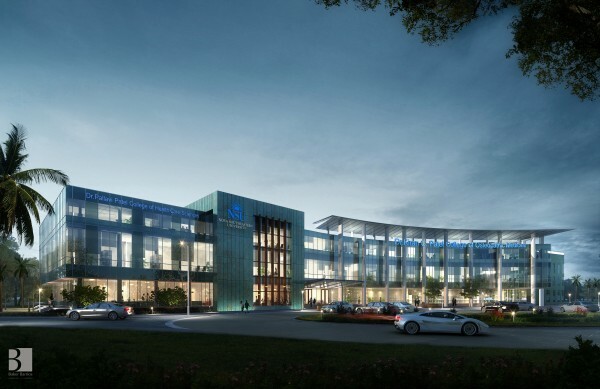 Their generous gift—the single largest that NSU has ever received and one of the seventh-largest ever to a college or university in Florida— has been designated for expansion of NSU’s College of Osteopathic Medicine and College of Health Care Sciences. The details of The Patel Family Foundation’s commitment was unveiled to NSU and global media during a press conference on Monday, September 25, 2017 at 11:00 a.m. The press conference was live-streamed online for everyone to watch. Following the press conference, at noon, everyone gathered in front of the Terry Building to unveil the names of NSU’s Dr. Kiran C. Patel College of Osteopathic Medicine and NSU’s Dr. Pallavi Patel College of Health Care Sciences. With this gift, the Patels’ goal is to help advance health care in Florida, across the country and in multicultural communities here and abroad. Their priority, which aligns with that of NSU’s Health Professions Division, is on putting the “patient first” and integrating medical and health care expertise. NSU is the top provider of osteopathic doctors in Florida, the majority of whom treat patients in medically underserved/rural areas. Graduates of NSU’s College of Health Care Sciences, which includes 19 different programs such as Physician Assistant, Occupational Therapy, Physical Therapy, Respiratory Therapy, Anesthesiology Assistant, Speech-Language Pathology, Cardiovascular Sonography, and Audiology, fill critical health care needs in communities locally and globally. This was a key factor in the Patels’ decision to support NSU’s D.O. and Health Care Sciences programs. Their aim is to be involved in the training and education of generations of physicians and other health care providers who will then serve in areas with the greatest need across the globe. No matter what college you represent or what your role is at NSU—student, professor, researcher, staff, alumni or philanthropist—today is a proud day to be a Shark. To learn more about the transformational gift, visit nova.edu/patelgift.